The purpose of yoga is to prepare for meditation. Yoga has no purpose other than enabling one to achieve the meditative state. Through the methods of yoga, however, the ‘side effects’ of yoga come into play; presenting clarity, good health, increased energy, removing depression and whatever else might be standing in the way of you experiencing the meditative state and being able to remain in it. If the body is suffering from illness and pain, or if fear and anxiety occupy the mind to such a degree that it is the only thing you can identify with, then you must find ways and means to rise above it. With Patanjali, a branch of yoga came into being that would come to influence the conception that people have of yoga and what they expect from it. The rather theoretical yoga of Patanjali was preferred in learned circles – here, his ideals of controlling the mind were seen as preconditions rather than results of practice. Therefore, the description of yoga in encyclopaedias and other literature has generally been identified with this interpretation, and with the branch that developed after Patanjali called Raja Yoga. In the four small books of sutras on yoga, each containing from between thirty to fifty short verses, Patanjali is both inspiring and brilliant, and any self-respecting yoga teacher education naturally has his book as a part of its curriculum – together with other texts from the tradition. However, Patanjali has given the intellectual and cultured citizen of the east as well as of the west an excuse to think, philosophise and moralise instead of realising and experiencing the effect of the actual yoga and meditation techniques. When one is stuck with concepts alone, something quite different, namely the tangible effects of the practical exercises fail to appear. In the same way that Puritanism dominated in Europe, so it was in India, where a rigid scholastic interpretation of Patanjali came to overshadow all other yoga. Ideals arose so large that it distanced yoga from common man. Naturally, Tantra and the Tantric meditations include elements described in Raja Yoga, for the simple reason that Raja Yoga is a small branch which has grown from the tree of the Tantric tradition. Yoga is accessible not only to those wanting to control life and themselves. The Tantric tradition includes much more, enabling you to submit yourself to the changes of life, while remaining at one with your self – to learn to live fully. In Tantra, the yogis have continued along the original path, undisturbed by prevailing fashions and limitations. Even today, this happens in the way you relate to life and to the discovery and reclaiming of yourself. The importance of practical and tangible exercises, rituals and meditations is emphasised. It is something you do. Theory alone is regarded as a kind of by-product, arising from the communication with those who do not yet know the finer states. It is the personal and direct contact between people that counts when this knowledge is passed on. Whatever you experience, you acknowledge and use in the process of realisation, rather than avoiding it through control and restraint. This approach is of fundamental importance in Tantra – in its practices, rituals and meditations. It is not a question of taking severe measures, but of being aware and present in what is anyway done, thought and experienced. In a devoted and yet neutral way, you let happen what happens, without reacting or struggling against it – and without giving up or letting yourself be overwhelmed by or dependent upon anything. It is safe to say that through meditation, you restore the cells to their natural state and frequency. You neutralise inhibitions and influences which normally captivate the mind and lead one to forget oneself and place the identity in something other than what one really is. A clear example of this is stress. However, other physical and mental troubles or illnesses can also be avoided by returning to the original state – as it was before whatever influenced the state and upset the balance in the body and mind. of your own true form. By using the techniques and meditations of Tantric yoga, and thereby realising what captivated or fascinated the mind are but mere experiences – you then remove the very limitations mentioned by Patanjali. Let’s take, for example, a strong emotion of anger or sorrow. In the midst of that state, in the midst of that emotion, you go on experiencing it and thus you allow what you experience to happen. You do not try to interfere with the thought or the emotion. You do not try to stop it. You allow it to express itself and spend its fury. You neither try to avoid the anger or sorrow, nor do you cling to it. Therefore, nothing is left hanging afterwards in the form of tension or a grudge, and you can continue to live in the now. A picture that may illustrate this: As a child, I would be quite overwhelmed by the cold after swimming in the sea. I shivered, my teeth chattered, and I could barely put on my clothes again and do the buttons up after drying myself. This could go on for quite a while, unless at some point or other I gave up and allowed myself to be in that freezing state. When I allowed myself to experience the state, the shivering and chattering ceased at once, and I calmed down and regained warmth. Meditation teaches and trains us to be receptive and creative towards ‘reality’, instead of constrained, infatuated, submissive or in a reaction. Small “hooks” are found in the mind, Sri Aurobindo stated; a yogi who lived in Pondicherry, India, in the previous generation. These hooks catch the thoughts that fit them. Thoughts that appear in the mind again and again are ‘maintained’ by the hooks. They hold us prisoners in certain attitudes and expectations. To become free from habitual thoughts and limiting ideas of ourselves and our surroundings, from states such as stress, unwanted changes of mood and the experience of too much or too little energy, we have to straighten out the hooks. The thoughts will then no longer stick to the mind, we can let go and let them pass. How does one abolish enslavement to the thoughts? After all, it is not only the opinions that we hold on to and defend, but also the more unconscious, automatic thoughts, which colour our reality; thoughts that appear by themselves in every situation, that judge or explain whatever we are facing. Can we regard them as just thoughts, or do we believe them? How many times has your mind, without any consideration, judged a situation, and you taken for granted that what your mind presented was true? Did you know? Or did you guess? When we do not realise that the mind often functions in a completely automatic way, presenting us with ready-made opinions, we are kept in a prison of grey routine. Thus, we are unable to see things anew and unable to adapt to each new situation. It requires a special ability to disregard the seductive games of the mind. After all, the mind, with its senses, is the tool through which we survive in this dimension on Earth. In the Tantric yoga tradition, there are techniques that can help us see through that which the mind presents to us, so the mind becomes a real tool instead of a slave driver – and we become independent. The meditation we deal with here is called Antar Mauna. 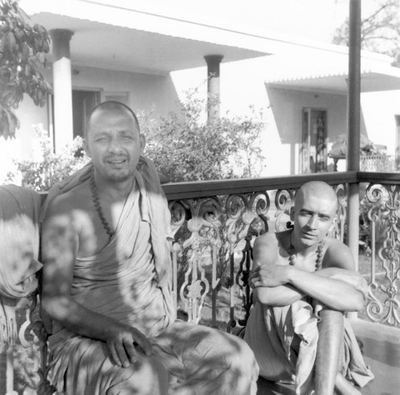 Translated from Sanskrit, it means Inner Silence – a pearl of a meditation, which I learned from Swami Satyananda when I lived with him for some years in the late sixties. In texts from Kashmir (some are said to be over 4000 years old), intense, short sentences or verses (sutra) reveal essential instructions in Tantric yoga and meditation. As part of an initiation that was, otherwise, passed on verbally and secretly from teacher to student from generation to generation, for thousands of years. There are various texts which, early on, hint at this knowledge of the mind, the way it is expressed in the meditation: Vigyana Bhairava Tantra, Sochanda Tantra and Malini Vijaya Tantra, quoted in the article under one name: Vigyana Bhairava Tantra. Excerpts of the work were first published in the West in 1955 in Gentry magazine in a transcribed version by Paul Reps and later incorporated in the book Zen Flesh, Zen Bones. From this Tantric tradition grew, for example, the deep relaxation Yoga Nidra. Also, a meditation, Antar Mauna (Inner Silence), emerged that, in its basic form, consists of seven parts. Apart from this, there are more advanced variants, where the teacher, during the meditation, constantly allows himself to be ‘infected’ by a student straying and identifying with different states, experiences and even diseases, only to free himself from them, together with the student, and return to the essential. Already before the rise of Buddhism, traces of this meditation can be found in the Tantric tradition – yes, even before Alexander the Great coined the word Hinduism as a collective term for the way people lived by the Indus river. Tantra was an independent tradition and science even before certain aspects of it became integrated, first with “Hinduism” and later with Buddhism. The Tantric literature is outwardly called non-Vedic, Agama, in order to declare its independence from the Vedic tradition, on which Hinduism, to a great extent, is based. as for an unenlightened person. When Buddhism came to Japan, the Tantric element it contained laid the basis for the meditation Za-Zen. In its attitude and in all its simplicity, it is related to Antar Mauna. There are also many similarities to the Buddhist meditation Vipasana. It is used especially in Southeast Asia. Its name can mean unfettering. In Tibet, a similar method developed from the Tantric source; the meditation Maha Mudra. When it was presented by Evans-Wentz in the 1930’s, he called it “the yoga of the great liberation”, or “the yoga of the great symbol”. The fact that Evans-Wentz and the lamas with whom he collaborated have chosen the latter, somewhat abstract translation of the title, requires one to reflect on the meaning of the word symbol – which I shall refrain from doing here. Evans-Wentz himself admits in the commentary to the title, that mudra means attitude. From my own background, I can translate Maha Mudra as: the great attitude, signifying the greatest attitude, the best attitude one can have to life. There is, however, the pitfall with this Tibetan variant, inspiring though it may be, that it has a relatively large philosophical superstructure. This could easily lead to an ‘understanding’ of the concepts that one should otherwise be free of – one philosophises and becomes reliant upon one’s own notions, thus blocking the experience of, or the insight gained from, the meditation. This, probably, is the sole reason that the more direct teaching from teacher to student, as always in Tantra, may not and cannot be recounted in writing, it must be received in a teaching situation. However, when Maha Mudra is used correctly it can, just like Antar Mauna, embody both the most fundamental and highest form of initiation. “… The various concepts, too, being illusory, and none of them real, fade away accordingly. Thus, for example, everything postulated of the Whole, the Sangsara and Nirvana [illusion and reality], arises from nothing more than mental concepts. Changes in one’s train of thought [or in one’s association of ideas] produce corresponding changes in one’s conception of the external world. In general, all things mentally perceived are concepts. The full realisation of the passing away into Nirvana is also a concept of mind. Misfortune caused by demons and evil spirits is also a concept of mind. these words are only for those terrified with the universe. This universe is a reflection of minds. The Tantric meditations do, to a great extent, go together. That applies to the original Tantric meditations that were found, and are found in India, and the corresponding meditations that were assimilated by Buddhism in general, in Tibetan and Japanese Buddhism in particular. However, there is one crucial difference – a choice, perhaps – for someone standing outside, looking in. The difference lies in the goal itself, and with it, the insights which the underlying concepts convey. What they do have in common, on the other hand, is awareness and the ability to experience. Will not realise the ultimate. February 1969, from the time when I received the teaching and training that laid the foundation for the insight on which this article is based. Who is it then that experiences? When I was a child, I experienced myself as a child. When I was a teenager, I experienced myself as a teenager, and in this way throughout life I have experienced myself in its different periods. Who am I? The body has changed. Each time I had to have my passport or driving licence renewed, I needed new photos. The old photos do not resemble me any more. And the personality; well, that has undergone its phases. Ideas have been replaced by insight, hope by contentment, which again was followed by disappointment, frustration, hope and contentment. It is as though life is a large wheel and we tear along somewhere out on the rim. The rim is divided into life’s phases – phases where everything runs smoothly and falls into place, interspersed with phases of resistance and adversity. It may hurt when we have to let go of customary values because experience and maturing tells us that they will not hold – and we are torn between action and reflection. And behind the personality? Isn’t something stored? Something individual? A growing knowledge? A knowledge that is not merely intellectual in character, a maturation that, in spite of it all, takes you in the direction you once envisioned that life maybe would go? A greater benevolence perhaps, a greater tolerance? And a greater courage to stand by that which is of value and needs defending, a determination to cut through all empty imitations and automatic ways of doing things? Is life, I wonder, a constant spiralling closer towards the wheel’s hub, where a real overview exists – towards the hole in the hub? And something else I also got from the meditation: an ability to seek, which extends further than that of thinking or understanding, an ability to experience. Experience what? No, not the meaning of life. Life gives us that, as Piet Hein says, right up to the day when we ask about it. But something else; a search for that ‘place’ which is not really any place, but everywhere, as the water in the sea and the air in the space we live in, a state, an attitude, a symbol. In the beginning comes a glimpse, an experience of what is eventually to become a familiar place, a state. A place to return to again and again, to be, to rest and restore the fundamental harmony in body and mind. Life changes constantly, but here doesn’t change – here is still, here IS – silence – and life unfolds on the background of silence. “This consciousness is the spirit of guidance of each one. “The Hindu, when he hears the term ‘non-self’, immediately thinks of the Absolute with which the Self is identified. In maintaining this, however, he neglects the systematic and scientific method inherent in meditation, where a beneficial effect transpires progressively, regardless of what you may think, just as long as you are capable of following the method. Subsequent to Jung’s death, such effects have been measured and confirmed in medical laboratories world-wide. Also, what he apparently did not know, was that, as one gradually becomes experienced in meditation, a new light is cast over things, and everything appears different than the expectations and the philosophy one had before beginning to meditate. and all that you are anyway. 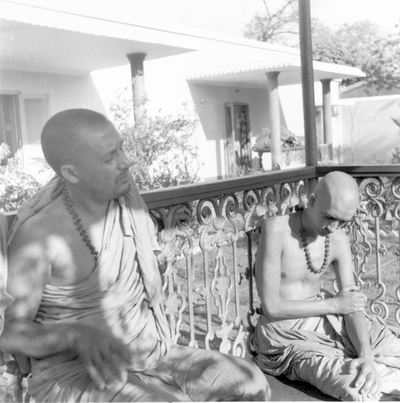 Informal discussions around the fire, the day before I (on the left) received my initiation to become a Swami by Swami Satyananda (on the right). One day, a ‘sadhu’ came to the ashram in Monghyr asking for shelter and received it. 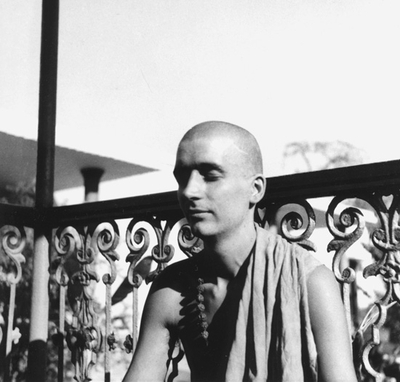 Since he had come to an ashram, then he would also meditate. 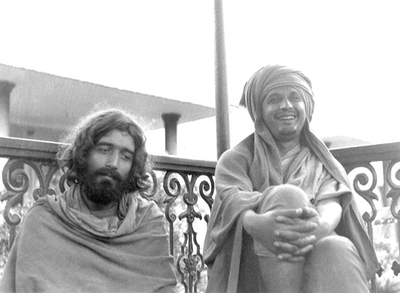 I was curious, and when he had left again, I asked Swamiji what he had been doing. How is Yoga and thus Meditation defined? I don’t want to use that hackneyed definition of yoga, where one speaks of becoming one with the higher self, or to unite the higher and lower self. Higher and lower, that’s nonsense, there is just one. Such a definition is based on false ideals, which may just as easily distance people from themselves, as it may be inspiring – in such thinking, a demand to be holy is hidden, something that can give a sense of guilt, lead to hypocrisy and make one become censorious or compare oneself to others. Who is higher? Who is lower? Where do I stand? No thanks! There is a definition of yoga which I hope cannot be interpreted in this way. And it implies that it is something that the individual can do with a little help from tradition and a good teacher, but without having to compete on the spiritual or other planes. “The purity of other teachings is as impurity to us. After all, this is about that which one is already, in essence, or everywhere: Stillness is our consciousness, the one which experiences, behind it all. One is stillness – and everything else: sounds, what one sees, feels and smells; nature, the town, all material and all inner things, feelings, thoughts, inner pictures, dreams; all these are experiences, which change and are forgotten. The definition of yoga can be expressed by a symbol. It is an archetypal symbol which certain movements, religions and countries have taken for their symbol (e.g. Israel) that is true, but it is not limited to a movement or a nation. Two triangles, one pointing upwards and one downwards, is forming this symbol: the six pointed star. It is found in all cultures. 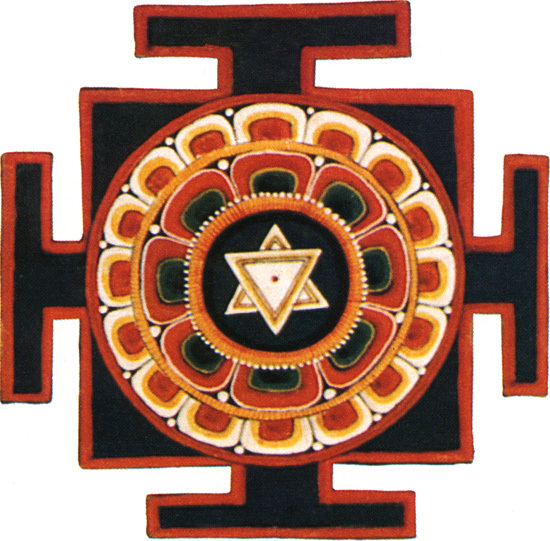 On the clothes of the prairie Indians, it is often placed on the middle of the chest.In the Tantric tradition, it is found in various symbols or yantras, like this yantra for meditation – but also in the yantra of Anahata Chakra, the psychic center located at the level of the heart. You find it in the beginning of this article. 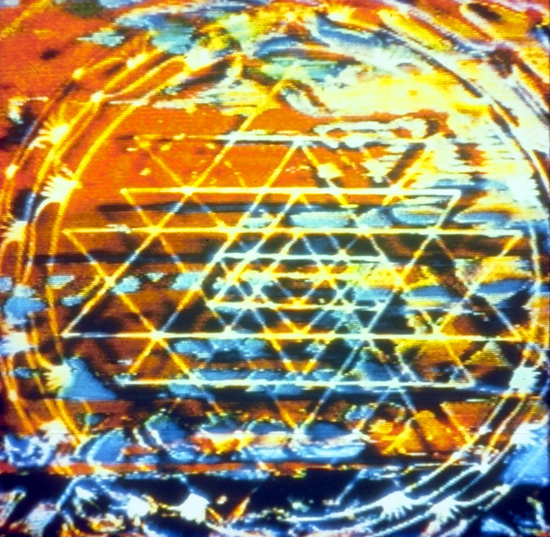 This symbol expresses harmony between the experiencer and that which is experienced. When this harmony comes about, unity is experienced between the two – unity in everything. One could also talk about the stillness, about the one who is experiencing and the experiences, in another way. One could talk about energy. Everything consists of energy. The atoms in the walls are energy, and my body is energy. What comes out of my mouth when I talk is energy, thoughts are energy, emotions, everything. It is what I experience… energy. Naturally, I have experienced when harmony is not present when I try to control or suppress my thoughts or feelings, when I identify myself with them, or when I have been overwhelmed so that I forget myself. But here, the question is not whether there is control or lack of control. It has neither to do with rebelling nor with taking everything lying down. It is about being present, in the midst of what is happening, inner as well as outer. That is a Tantric definition of yoga. This is trained in the meditation Inner Silence, because it isn’t really something you think about or philosophise about. It is something you do and you learn this with the help of the techniques. Inner Silence is an absolute necessity for all other advanced yoga and meditation, including the more advanced forms of Kriya Yoga. 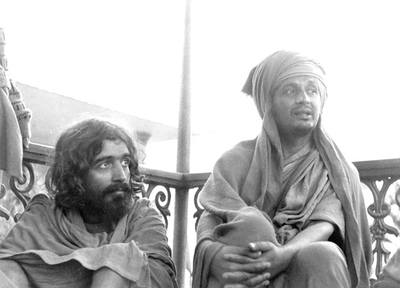 It was at a time when Swamiji taught everything himself. What appealed to me was a view of life which, in a great many ways, harmonised with my own. He was sober-minded; yes, almost atheistically scientific. When my students learn Inner Silence, I ask them not to be idealistic. Try not to be other than you normally are when you sit down to meditate; you don’t need to act holy, good or ‘positive’. Begin the meditation as you are. It is unimportant for the outcome of the meditation whether you feel happy, unhappy, tired or full of energy. Or whether you are restless, shaken or apathetic. Sit down and begin the meditation wherever you are, the way you feel. If you want something from the meditation, then cease to have all kinds of expectations or associations between you and what appears of itself in your meditation. You need neither to have negative nor positive notions of yourself. You are the Inner Silence, the silence on the background of which, you experience what happens in your mind. Experience what happens without wanting to influence it, so it can happen spontaneously and without being restrained or changed by your ideals or expectations. Only then, can you get to know it as it is. Let the experiences come of themselves without you interfering in the least. Remain the one who is experiencing. It was a concrete teaching in exercises and meditations, and a training in awareness – a spiritual attitude without any form of worship or manipulation of people’s religious feelings. Antar Mauna is a meditation that starts in the totality of where you find yourself, in the world that you experience through your senses, in that place and in those surroundings of where at the moment you are meditating. You train your ability to experience. From the senses you proceed gradually and inevitably through the states, habits, thoughts and emotions that your personality normally contains. You learn to experience the personality without immediately becoming critical or analytical towards it, without inhibiting or changing it. You get to know it. Then you go deeper, through the various dimensions of your inner universe, to the innermost of your being, from where you experience everything. “Good or bad, I am the seer; disturbance or one-pointedness, I am the seer. If I change my physical position, I am the seer. I am not the concentrator; I am not the meditator. No, I am just the seer of all that is taking place in me. I am impartial, detached and unrelated. This is a meditation that is best learnt directly, from teacher to student, so that the mind does not resort to equivocations; so that one is constantly guided back to oneself, to the one who experiences, behind it all. It is based on laws or tendencies in the mind which are common to all people. It is not surprising, therefore, that also in Europe, we find references and instructions, through various ages, that point toward a similar insight, like the one Inner Silence is based on. We will deal with these specific instances in other articles, just as in the future we will go on revealing some of the secrets of Inner Silence. The knowledge and insight sprouting from the meditation also influence daily life. 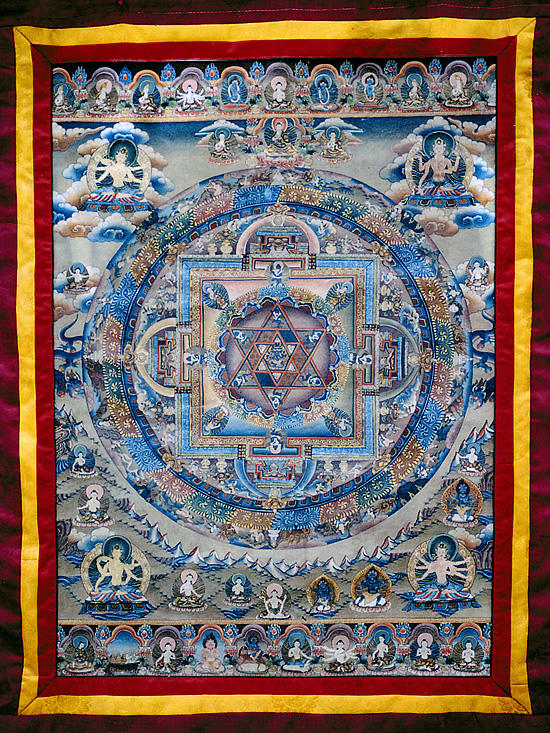 It represents the essence of Tantra, the Tantric attitude. You accept how you are, how you live. You don’t need to be another person to realise yourself – or to live. You don’t need to change, you are already – your self. “You are the one observer and, as such, you have indeed always been free. 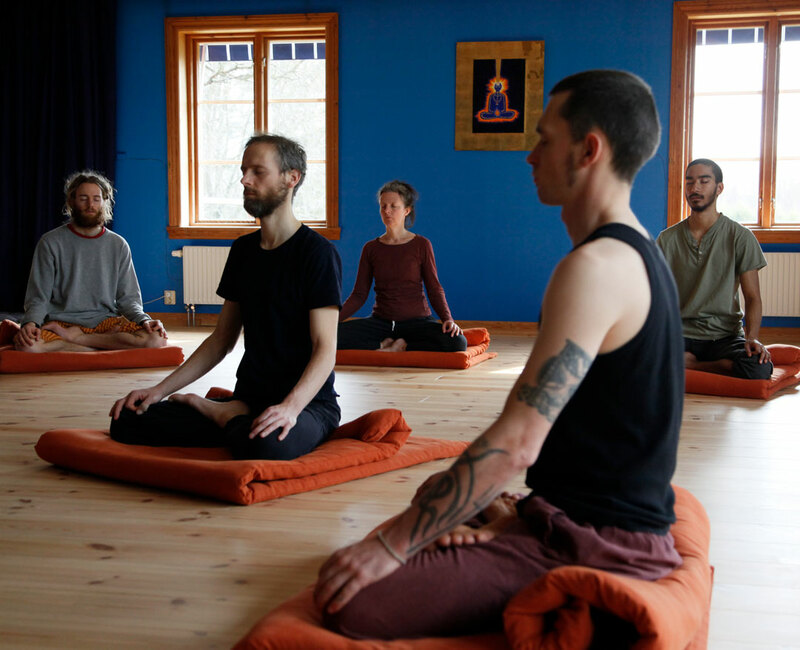 The following is an example of how a part of the first step in the meditation is guided verbally by a teacher, when during the learning process, one practises this in a group. Sit with a straight back (it can be on a chair, or in a meditation pose) and close the eyes. Sit for a moment without being busy with having something to do, other than just sitting. Do not demand anything of yourself. Do not expect anything from the meditation. Do not try to do anything other than what is happening anyway, here in the beginning. Now, turn the mind outward towards the surroundings – and listen to the sounds around you. Normally, when listening, one listens for something or one tries to avoid hearing certain things – but you don’t do that now – you listen to all the sounds in the surroundings together, the way they come to your ears. An all-encompassing awareness of sounds. Consciousness is like a light that shines equally in all directions. It perceives everything with the same interest. Nothing is emphasised, nothing pushed aside. Hear the car in the street, for example, at the same time as the ticking of the clock, at the same time as the television upstairs – Perceive the surroundings as a whole; all the sounds, at the same time. Do this for five to fifteen minutes, sitting some place where you have time to do it undisturbed. And also do it for a short while, a minute or two, on the train, in the bus, in a queue, on a bench in a park or at a market place; in town or by the sea, in the woods or in the countryside – wherever.